Your Own Web Page for Input, Questions, and Photos! Would you like your own Yoga Web Page? Well, here's your opportunity. Give us your yoga instructions! We need your input. Do you have something of interest or advice that can help our readers on their yogic path? Our Yoga and Meditation Forums are a free service we provide for you, our readers. Everyone is invited to join in. You don't need a member login, or even have to go through a registration process. It's free, fun, and easy to do! You can join in with your questions or comments. Write your own page. Add pictures! Some yoga topics have specific categories, like yoga for pregnancy, yoga for men and yoga for kids. Choose the category, or make a new one. Come on in! Let's join together to give input, solve our problems, share our ideas, or just talk! That's what yoga is about. The idea here is to help and be helped. The more the merrier! Everyone is welcome, and you can ask a question or comment on nearly anything related to yoga, meditation, the mind/body connection and spirituality. The following forum is for general yoga topics, so write about whatever is interesting or fun in your yoga practice. Have A Great Story About Your Yoga? Do you have a great story about your yoga practice? 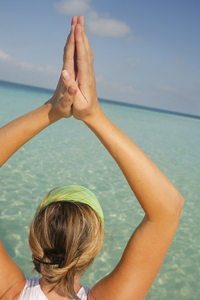 How did you get started and what is it about yoga that has made an impact in your life? You can ask me a question, and I'll be happy to answer. Share your accomplishments and brag a little! Tell us about your funniest moment in a yoga class or your most heartfelt experience. Your input can help and encourage others in addition to giving you your own audience and web page! Here's where you can inform others about your yoga practice, ask questions, and get answers. Form your own yoga community! Enter a Title about what you're writing. Is this what I needed to find?